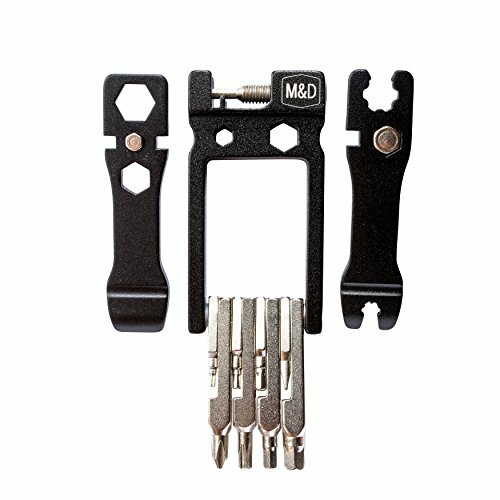 Bike Multitool MadWares 24 in 1 Bicycle Multi Tool Repair Kit with Wrench Set by M&D Wares at Melon City Bike Club. MPN: 4333610629. Hurry! Limited time offer. Offer valid only while supplies last. MadWares 24 in 1 bike repair multi tool comes crammed with just about all the essential tools you could want for roadies and mountain bikes alike. MadWares 24 in 1 bike repair multi tool comes crammed with just about all the essential tools you could want for roadies and mountain bikes alike. Even more surprising, it has all 24 impressive functions packed into the compact durable all-metal frame, and at barely more than 120g is still very light. It has a chain tool, 5, 8, 10mm hex spanners, 2, 2.5, 3, 4, 5, 6, 8mm Allen keys, two flat-head and a Phillips screwdriver, T25 disc brake wrench, 3, 3.45, 4mm spoke keys, Mavic 1 and 2; two formidable and reliable integrated metal tire levers round up a comprehensive list. With all the 24 functions squeezed into a small frame of 3.1x1.6", this exceptionally compact and slim multi-tool easily fits a jersey pocket, and it won't take up too much valuable saddle bag or pouch space and weight. Free high quality tool bag supplemented with belt loop allows you to carry your bike toolkit with comfort. The rotating bits are stamped with their sizes making it easy to pick the right one really quickly. The straight lines of a handy metal frame sit really comfortably in your palm. Multi-functional and lightweight as it is, this bike multitool is also great for adjusting the bike attachments, anything from bike carriers, bike racks, baby carriers to bicycle computers, lights and bottle holders. With this multi tool, you're ready for almost anything that goes wrong with your bike. If you have any questions about this product by M&D Wares, contact us by completing and submitting the form below. If you are looking for a specif part number, please include it with your message.